You can unlock a Tesla Model 3 using your phone, only! The Model 3 has no key, so your phone is your gateway into the car. Don't worry, though - there's backup as well. 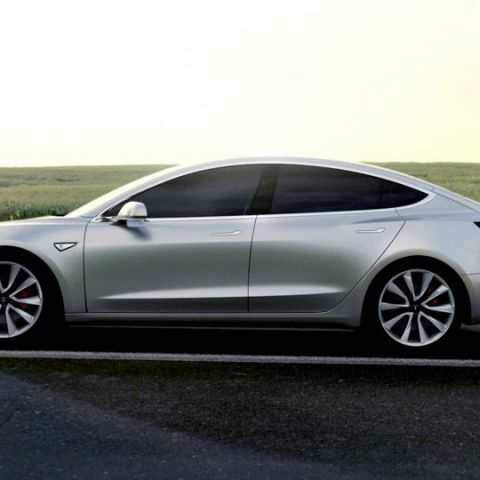 The Tesla Model 3 is without any argument one of the most technically advanced cars, and it also happens to be one that is seemingly set to change the way we fundamentally travel. For instance, the new Model 3 does not have an actual key. Forget about keyless entries, this one's primary way to enter is by using the application interface from your smartphone, and using its Bluetooth connection as the authentication. Tesla uses the Bluetooth Low Energy standard to unlock the doors via smartphones, and will have customised authentication to make sure that the technology is not misused. However, if you are out, need to reach a meeting as soon as possible and your phone happens to be dead, you can still open the doors by using a couple of NFC cards that are provided with the car. Tapping the card on the car's B-pillar opens the doors, and tapping it on the central console starts the car. The usual way of starting the car also happens to be by using the phone and its Bluetooth. Things have really changed a lot, haven't they? Keyless entry, start-stop and connected phone apps are not a rarity. Most cars now come with keyless entry and keyless start, where the driver needs to carry a key fob in the pocket. This key fob emits a unique radio signal that the car can identify and authenticate to unlock and start the car. Even Tesla's Model S and Model X did not do away with the keys, but the Model 3 seems set to herald a completely new future in terms of how we drive. Can you create a youtube account and still have your old email?